When Aurora meets Trey, a famous singer and musician, she's only hoping to get her fill of human blood for the week. The last thing Aurora expects is for Trey to make her feel alive for the first time since she was, well, alive. It begins with a casual painting lesson at her art studio, The Waking Moon, and quickly turns into a forbidden romance. Aurora is forced to hide her true identity from Trey, while keeping her relationship with the human a secret from other vampires in her Brood. Trey's band is recording a new album and with Aurora as his muse, Trey is writing songs like never before. After being hired by their record label to paint the cover of the new album, Aurora has a legitimate reason for spending so much time with Trey and his band mates. Aurora can't deny the unexpected connection she has with Trey, which is fueled by glimpses into his emotions every time they share a kiss. Caught between two worlds, Aurora must attend celebrity award shows and vampire rituals, find time to feed, and protect Trey from the dangers of the night, all white preserving her secrets. 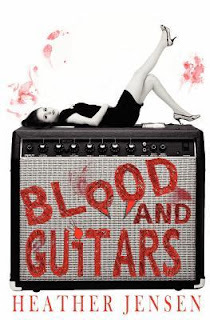 Before I begin I want to say that Blood and Guitars is not a bad book. Overall I did enjoy it, but it took a little work. And when you are reading novels for review and kind of on your own personal deadline instead of just for enjoyment you kind of need to read novels that are in your face and intense. I would highly recommend this book for leisurely reading, because at least in my experience reading it Blood and Guitars isn't a fast paced speed read. I wasn't flipping the pages at high speed rates to try and find out what will happen next. It was a leisurely paced novel. To explain in a graphic setting I wanted Blood and Guitars to grab me by the balls, but instead it just held my hand. I was ready to take this book home on the first date, but the book just wanted a polite kiss goodnight. Do you get where I am going? It is a really good book, but it just wasn't intense enough for me. I would say that yes I agree that this is a paranormal novel, but I would say it is also on the border of being a contemporary. If you took out the fact that Aurora is a vampire and just made some other reason why they weren't allowed to date I would say it was a contemporary. Towards the ends that changes. Once we see more of Aurora's side of life it turns more towards the paranormal side and gets really, really good, but then it ends. I think the problem I had with this novel was that it focused more on the relationship between Aurora and Trey and not so much the other side of Aurora's life. She is a vampire for crying out loud. I need to know what that means, because with every vampire story you read it is a different history and a different set of rules to live by. I think maybe Heather should have included more of Aurora's side of life, because I feel like we know Trey's life inside out, but Aurora is still a mystery. I have a very big and good feeling that we will learn all there is to know about Aurora's type of vampires, because of what happens at the end and I think that second book will get a much higher rating from me once I can get my hands on it. I did enjoy the main characters a lot (Trey and Aurora), but like I said before I just wish I knew more about Aurora's life, because I feel like she should have been more of the main focus, but then again if she was what would there be left to write about in book two? See it's a slippery slope with this series, because there was a lot left out, but probably for good reason so I can't be too hard on it. I am very interested in continuing with this series, because once it got towards the end the book really picked up. I really want to know more about Aurora's past, and future, and learn more about what being a vampire means in this series.